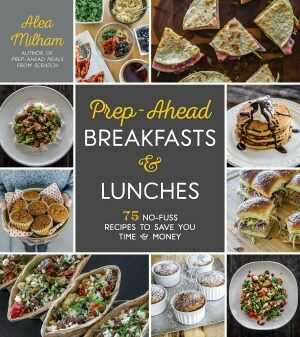 Want to save time and learn how to cook corned beef in a pressure cooker or Instant Pot? 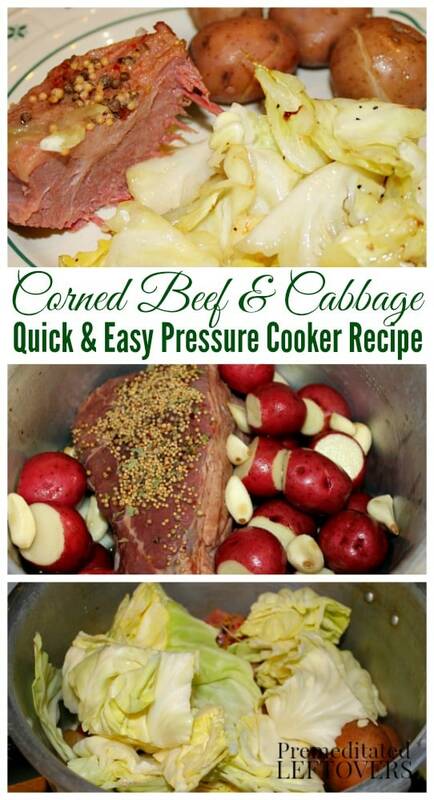 You are going to love how quick and easy this pressure cooker corned beef recipe is! 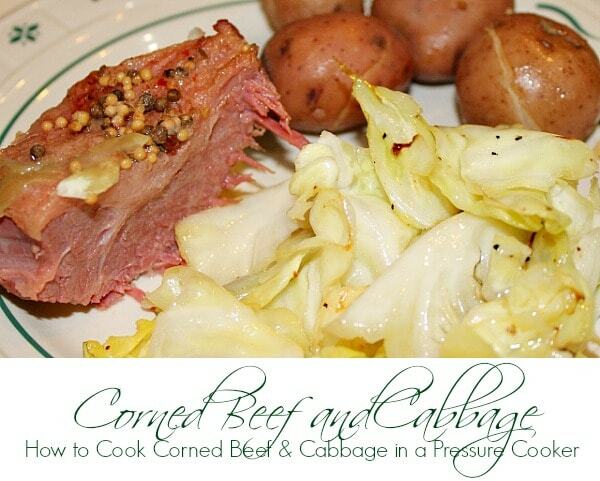 In fact, after making Pressure Cooker Corned Beef and Cabbage, I don't think I will ever cook it any other way. It is fall-apart, fork-tender deliciousness that should not be limited to one day of the year! Cooking corned beef in a pressure cooker was one of my best discoveries. I started cooking corned beef in a stovetop pressure cooker 20 years ago. Then I got an electric pressure cooker and started using that to cook my corned beef and cabbage. And then the Instant Pot came along and of course, I had to make Corned Beef and Cabbage in an Instant Pot. 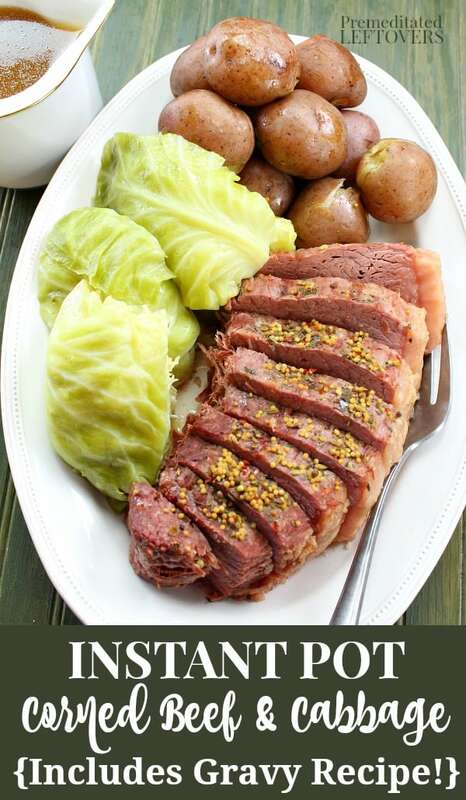 All of the methods create a delicious and flavorful corned beef and cabbage in a fraction of the time it would take in the oven or slow cooker! How long do you cook corned beef in an electric pressure cooker? It only takes 40 minutes to cook corned beef in an electric pressure cooker or Instant Pot. That is a big reduction in cooking time over cooking corned beef in an oven for 2 1/2 hours! How long does it take to cook corned beef in a pressure cooker on the stove? I started cooking corned beef on a stovetop pressure cooker back in the day. It takes a little longer for the stovetop pressure cooker to reach high pressure, so the total cooking time will be closer to 50 minutes. Over the years I have acquired an electric pressure cooker and an Instant Pot. 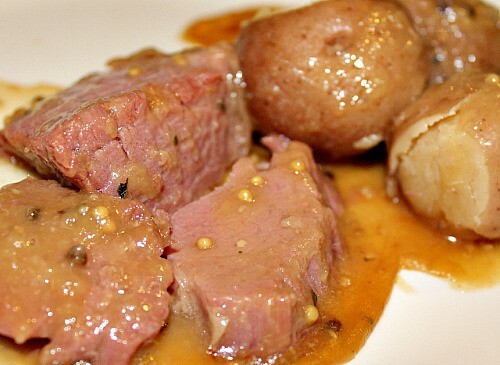 You can cook corned beef and cabbage in your Instant Pot or electric pressure cooker, but depending on the size you may have to use a smaller corned beef brisket and fewer potatoes. Be sure to follow the directions for your cooker and don't overfill your pot. Can I cook potatoes with the corned beef? Absolutely! I add medium to large red potatoes to my corned beef and let them cook together. 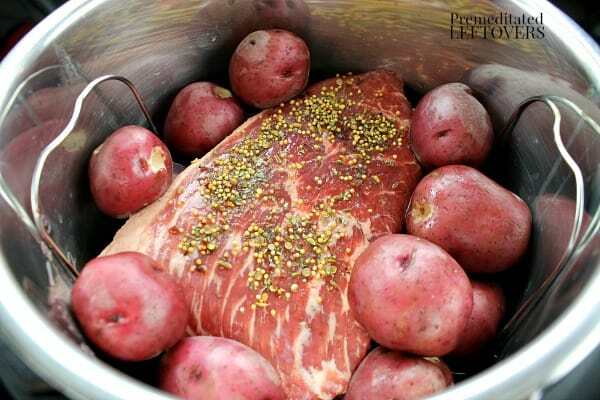 If you choose small red potatoes, you will want to cook the corned beef for 25 minutes, then use the quick release method to release the steam. 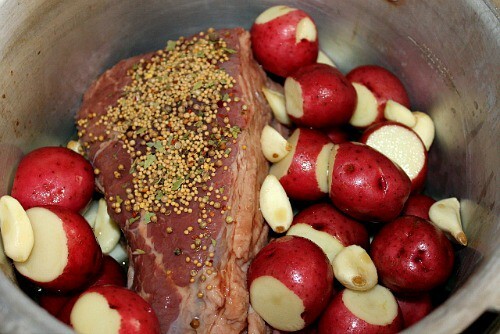 Then add the small red potatoes and cook at high pressure for another 15 minutes. I don't peel the potatoes. I just wash them, cut off any bruised spots, and throw them in whole. They will crack open while cooking and all the flavors will seep in, effortlessly creating the most flavorful potatoes EVER! If you don't get a spice packet with your corned beef, you can make the spices yourself using the following spices. You can quickly and easily make corned beef in an Instant Pot on high pressure or in an electric pressure cooker or stovetop pressure cooker. You will find the directions for each method below. Place the corned beef on the rack in the Instant Pot. Add the onion, potatoes, and garlic. Pour broth over the meat and veggies. Sprinkle spices over it all. Place the lid on the Instant Pot. Ensure the valve is sealed so that no steam is released. On an Instant Pot, push meat or manual which should select high pressure then select 40 minutes. When your Instant Pot has stopped cooking, open the valve to quickly release the steam. Remove the lid, remove the cooked potatoes, place on a dish and cover to keep warm. Add the cabbage to the Instant Pot. Replace the lid, close the valve, select manual and set the timer for 1 minute. As soon as it is done cooking, open the valve to release the pressure. 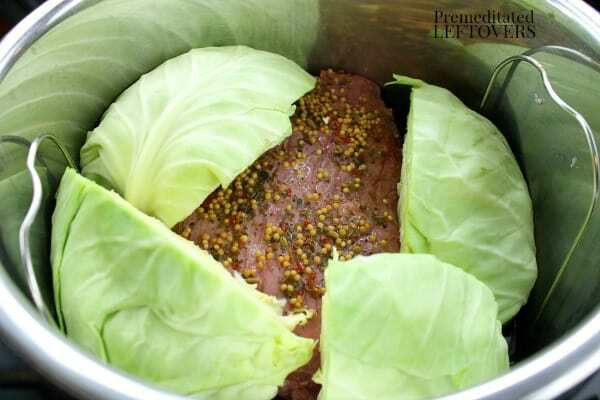 Remove the cabbage and the corned beef and cover them to keep warm, then use the drippings to make gravy. An electric pressure cooker releases a little more steam while cooking than the Instant Post, so I increase the broth by 1/2 cup. Place the corned beef on the rack in the pressure cooker. Add onion, potatoes, and garlic. Pour broth over the meat and veggies. Sprinkle spices over it all. Place the lid on pressure cooker. Ensure the valve is sealed so that no steam is released. On an electric pressure cooker, select high pressure, then select 40 minutes. When your electric pressure cooker has stopped cooking, open the valve to quickly release the steam. Remove the lid, remove the cooked potatoes, place on a dish and cover to keep warm. Add the cabbage to the pressure cooker. Replace the lid, close the valve, select High Pressure and set the timer for 1 minute. A stovetop pressure cooker releases more steam while cooking than the electric pressure cooker or Instant Pot, so you need to increase the amount of beef broth you add. Place corned beef in the pressure cooker. Add onion, potatoes, and garlic. Pour broth over the meat and potatoes. Sprinkle spices over it all. Place lid on pressure cooker. Cook over high heat until it reaches high pressure. Lower flame and stabilize pressure. Cook for 40 minutes. 4. Remove the pressure cooker from flame and run under cold water to release pressure. 5. 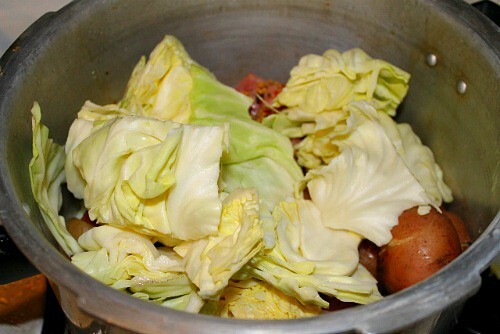 Add cabbage to the pressure cooker. Cook over high flame until it reaches high pressure. As soon as it reaches high pressure, remove from flame and run under cool water to release pressure. Note about cabbage: The cabbage only takes a few minutes to cook, so you add it at the very end. The cabbage really will cook in just the few minutes it takes to reach high pressure. Use the drippings from the pressure cooker corned beef to make gravy. Seriously, it will be the best gravy you have ever had! After you have removed the meat and veggies from the pot, add 2 tablespoons of cornstarch to the drippings. Use a whisk to blend the cornstarch into the beef. Cook on low to medium heat until it reaches a boil. Lower flame and boil until it thickens, approximately 2 – 3 minutes. You can mop up the extra gravy with some Irish Soda Bread Recipe. 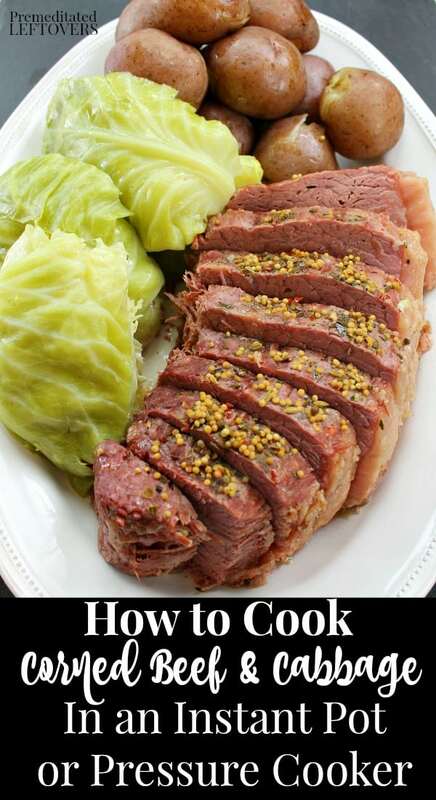 A quick and easy corned beef and cabbage recipe. Place corned beef in the pressure cooker. Add onion, potatoes, and garlic. Pour broth over the meat and veggies. Sprinkle spices over it all. Place lid on pressure cooker. Cook over high heat until it reaches high pressure. Lower flame and stabilize pressure. Cook for 40 minutes. Remove from flame and run under cold water to release pressure. Add cabbage to the pressure cooker. Cook over high flame until it reaches high pressure. As soon as it reaches high pressure, remove from flame and run under cool water to release pressure. Place the corned beef on the rack in the pressure cooker or Instant Pot. Add onion, potatoes, and garlic. Pour broth over the meat and veggies. Sprinkle spices over it all. Place the lid on pressure cooker or Instant Pot. Ensure the valve is sealed so that no steam is released. On an electric pressure cooker, select high pressure, then select 40 minutes. On an Instant Pot, push manual which should select high pressure then select 40 minutes. When your electric pressure cooker or Instant Pot has stopped cooking, open the valve to quickly release the steam. Remove the lid, remove the cooked potatoes, place on a dish and cover to keep warm. Add the cabbage to the pressure cooker or Instant Pot. Replace the lid, close the valve, select High Pressure and set the timer for 1 minute. 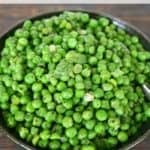 Remove meat and vegetables from the pressure cooker, but leave the drippings. Add 2 tablespoons of cornstarch to the drippings. Cook over a medium flame until it reaches a boil. Lower flame and boil until it thickens, approximately 2 - 3 minutes. We enjoy Pressure Cooker Corned Beef and Cabbage so much that I buy extra corned beef when it is on sale and freeze it. You can store corned beef in the freezer for 6 months. 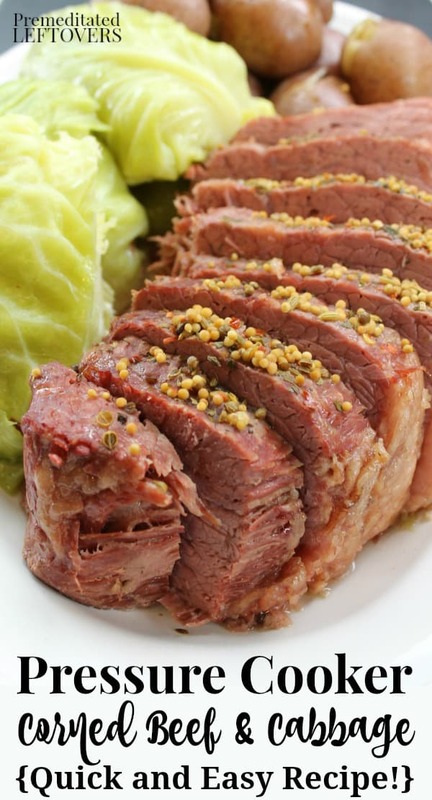 Do you only make Corned Beef and Cabbage for St. Patrick's Day? If so, below are some more ideas for your St. Patrick's Day celebration. Pressure cooker is real help always. It makes delicious dishes. This is pretty much exactly the way we do ours too, and I LOVE IT! 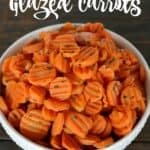 It’s so much easier, so tender and of course, so tasty!! This looks delicious! I will definitely try it. 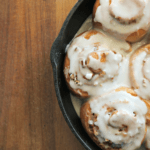 Love this post, I pinned on our mega shared pressure cooker recipes & news board. I wanted to invite you to join but Pinterest wouldn’t let me. Take a look, and let me know if you’re interested and we can figure out how to connect! 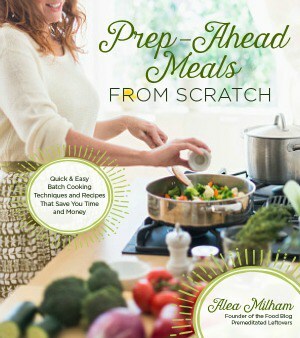 I read somewhere to add about 7 to 15% more time, when using an electric pressure cooker. My sweet daughter bought me one for Christmas (we had to do Christmas late this year due to back surgery (hers), so just opened it this weekend.) So do you think instead of 50 minutes, about 65 minutes would be about right? Complete novice here. We did this and it was incredible. I used onions instead of garlic. Oh! The potatoes! The gravy! You have changed us forever.